The Raptor EP-5 Mini ST Electric Guitar starter pack features a 31" Mini ST electric guitar. Constructed of a solid basswood body, the 31" guitar offers the perfect size and weight for your little rock start to play. It's equipped with a single coil pickup that delivers a great tone and hard rock vibes. The Mini ST offers the complete package for kid's 4 and up to start rocking away. A recognizable body scaled down to a half size scale, making it easy for kid's to hold and play. Equipped with a single coil pickup, this guitar delivers classic hard rock tones that's rich, crisp and edgy. Comes ready with everything you need to start playing. RICH AND CRISP TONES: Equipped with a single coil pickup, this guitar delivers classic hard rock tones that's rich, crisp and edgy. CLASSIC DESIGN: A recognizable body scaled down to a half size scale, making it easy for kid's to hold and play. LIGHT WEIGHT AND EASY TO PLAY: The guitar's guitar is constructed of a basswood body, offering kids a light weight instrument that's easy to play. 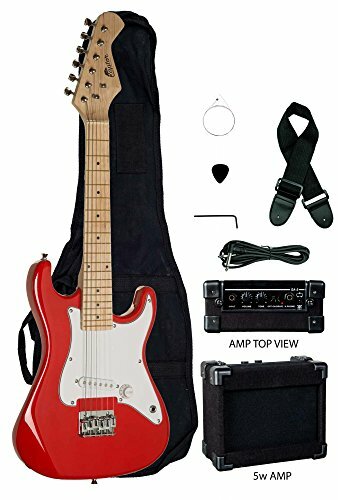 EVERYTHING YOU IN ONE BOX: Complete package has everything you need to start playing right away, including an amp, gig bag and picks!